Takara, Roll of the Month at Sumo Sushi & Bento! 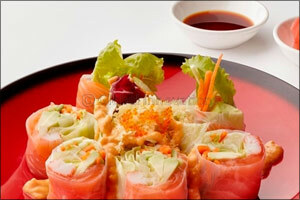 Dubai, UAE, January 06, 2019: Opening its doors in Dubai in 2000, the Japanese family dining franchise, Sumo Sushi & Bento, was launched by four Dubai-based entrepreneurs. The original Japanese family friendly restaurant, the brand now has 17 outlets distributed across the GCC. All the goodness of crunchy and fresh in one dish; rice paper roll stuffed with salmon, crabstick, carrots and avocado, and sprinkled with crispy tempura, and served with our special Hoshi sauce for only AED 35. Satisfy your avocado cravings with our crab stuffed avocado covered in panko and deep fried to a crispy golden delight. Served with a drizzle of spicy sriracha for only AED 42.